In the mood for love? Planning a night of passionate romance, love & affection? GiftsForYouNow has a vast selection of Personalized Romantic Gift Ideas sure to spice up a couple's evening. 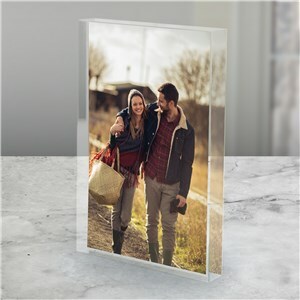 Set the mood with a Personalized Romantic Picture Frame featuring a special photograph of the two of you. Present her with a beautiful Romantic Keepsake & unique intimate apparel sparking a romantic evening. Our Romantic Gift Ideas will make your Romantic evening one to remember. Sweetest Day, Valentines Day and Anniversaries are all perfect times to give the love of your life a Romantic Gift from the heart. This Valentine's Day, give your sweetheart a heart keepsake that she'll cherish forever using our word art tool! 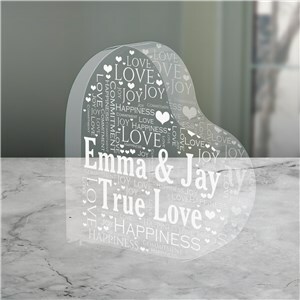 Customize heart-shaped acrylic Personalized Valentine Gifts like this keepsake with the words that best describe the bond you two share! He or she will love having this as a reminder of the love that the two of you share. Free personalization. 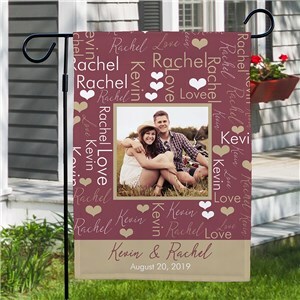 Display your love for all to see with our Personalized Word-Art Couples Photo Garden Flag in your front yard. We'll create this special couples garden flag using our word art tool, just add your favorite photo! You and your significant other will be represented in a unique, creative way. Our custom flags also make for great gifts for new homeowners! 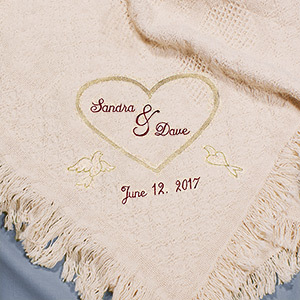 Our Embroidered Wedding Heart Afghan is a gift the couple can enjoy every day and will always remind them of their special day. Personalize this afghan with any two names and date of your choice. Makes a great personalized wedding or shower gift! 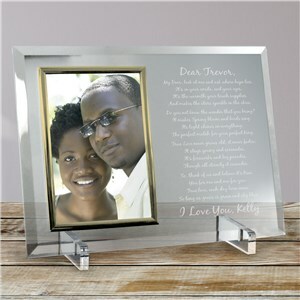 Display a romantic photo in this Engraved Mr. and Mrs. Beveled Glass Frame to treasure the love between any couple. 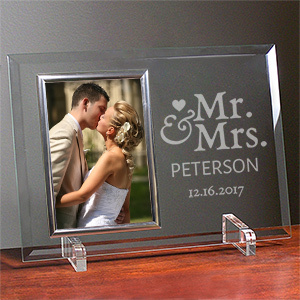 This Customized Picture Frame may be personalized with any name and date so it's perfect for weddings and anniversaries. Display your love for years to come! Love is clearly in the air when you display this personalized birds welcome flag with custom message. 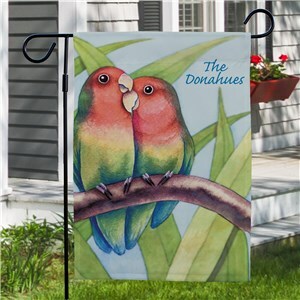 These colorful custom love birds Personalized Garden Flags will be personalized with any two-line name or message (up to 20 characters per line) to make it a one-of-a-kind item. This durable, all-weather flag measures 12.5" x 18" and makes a wonderful addition to your yard or home. The design may be printed on one side or both; optional garden flag pole, door hanger or window hanger each sold separately. 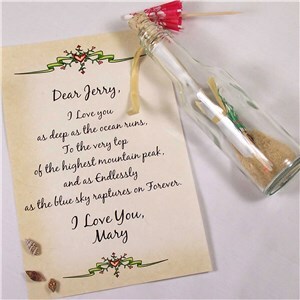 This custom message in a bottle is a romantic and personal gift perfect for Valentine's Day, Sweetest Day, your wedding day or any day you want to express your love! 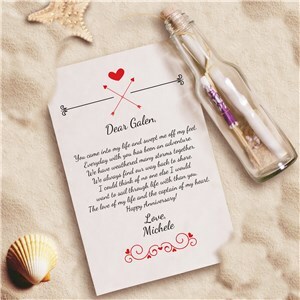 The adorable 6.5" glass bottle comes with sand, seashells, a beach umbrella and your very own custom message. For these Valentine Keepsake Gifts, you choose from three verses or write your own, then add your sweetheart's name to the top and a two-line sentiment to finish the verse. Your beautiful love message in a bottle is printed on parchment paper then rolled and tied with a ribbon and the bottle corked on top. This romantic gift can be shipped to you or directly to your love. It makes a truly special keepsake. Honor your love during any special occasion with our romantic message in a bottle custom personalized by you! Great as Valentine's Day Personalized Gifts For Her, birthday or even Just Because! Choose from three verses or write your own, then add your sweetheart's name to the top and a two-line sentiment to finish the verse. 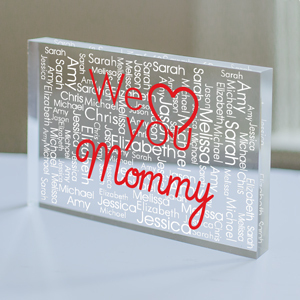 We will print a one of a kind word art design filled with names of you and your loved one on this personalized keepsake (printed in your choice of colors!) Create your design on this Personalized Couples Word-Art Block Photo Gift with our word-art tool, and upload your favorite photo. When creating your word-art portion of this Personalized Couples Word-Art Photo Acrylic Block using our proprietary design tool, if you would like to see another rendition of your word art design simply select the View Your Personalization button again. This will automatically create another version for review. 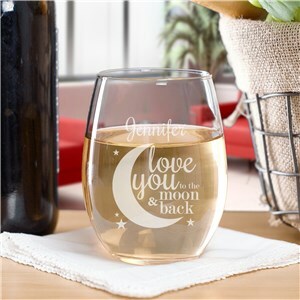 Give your Valentine something full of love to sip some wine or bubbly from with this Engraved To The Moon and Back Stemless Wine Glass, the perfect gift for any romantic home. We will custom create this wine glass with any name to make a gift she will love and love you for giving to her. All your wine loving valentines will love a wine glass of their very own this year! 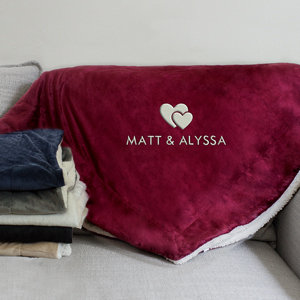 Get warm and cozy with your loved one wrapped in this Embroidered Double Heart Sherpa Blanket. 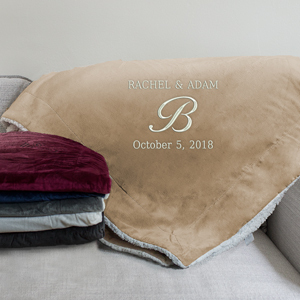 This blanket may be embroidered with any custom message line in your choice of thread color to make sweet Personalized Valentines Gifts. Makes a great gift for Anniversary or weddings, too! Create Cool Wedding Gifts with this photo gift! This Personalized Couple's Photo Acrylic Keepsake is unique just like their bond. Our one of a kind photo block will be created with your favorite picture to display year round! Give as a gift this holiday to any newly engaged couples! We will engrave this mug with any two names you choose. 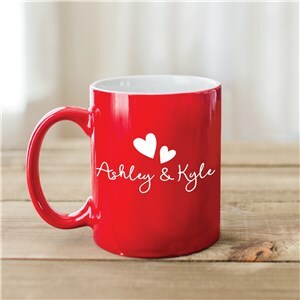 Even if your loved one isn't around for morning coffee, you can be certain they will be in your heart when you sip from this attractive Personalized Couples Coffee Mug! 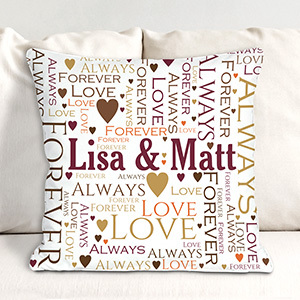 Brighten up any room in your house with our Personalized Loving Couple Word-Art Throw Pillow. Making your own Personalized Throw Pillows is easy and fun! Looking to create a Hot evening of passion and romance. Let GiftsForYouNow.com provide all of your Romantic Gift Ideas to get the evening started right. Get the Heat going with one of these Personalized Romantic Gifts.